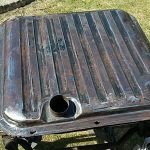 I started with an angle grinder with a flap disk on, which cleaned off all the surface rust, old paint and under-seal. It created a huge amount of dust in the garage but doing it in the garage kept the noise disturbance down, after all it was a sunny Sunday and I had a neighbourhood to consider. Painting was done with smooth black Hammerite (as previously) and several coats where applied as it was quite hot in the direct sunshine for the paint to dry quickly. 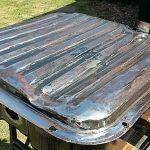 The end result looked nice and I may get to do another coat or two just to make sure the metal was well protected. 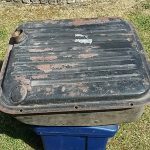 Corsair fuel tank – as bought in Feb 2018. 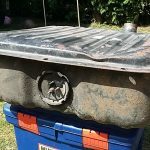 Corsair fuel tank with fuel sender unit – as bought in Feb 2018. Corsair tank, as it appeared after cleaning with flap disk and abrasive drill attachment. Underside already painted at this point. 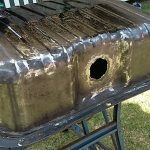 Corsair tank, as it appeared after cleaning with flap disk and abrasive drill attachment. 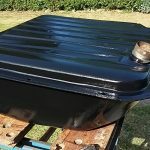 Corsair Fuel tank – in process of applying first coat of black smooth Hammerite. Hole is for the Fuel sender unit. 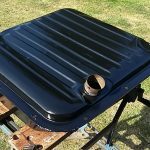 Corsair fuel tank, painted in smooth black Hammerite. June 2018. 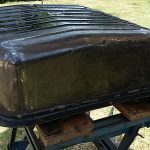 Corsair fuel tank, painted in smooth black Hammerite. Jun 2018. Since April, John hadn’t had a chance to come over and pick up the Corsair to sort out the tuning/engine running issues, not that it was a problem, as it really was an ‘as and when’ arrangement. So I had plenty of time to tinker, if I wanted. During a paint drying spell, I deliberated for a while whether to make another attempt at starting the Corsair. So patiently I fitted the battery, reset the TDC (Top Dead Centre) of cylinder 1 and adjusted the distributor to be more aligned on its cam lobe for cylinder 1. I then re-adjusted the carburettor mixture jet to 1 and 3/8 turns out and wound in the throttle stop screw 1 whole turn in. I switched on the ignition to get the fuel pump to drag up some fuel and then turned it over. It fired on the second proper attempt and was rather lumpy and irregular on full choke until I pushed it in about a quarter. Feathering the throttle, every now and then, seemed to flood or stifle the fuel flow in that it would almost die or cut out. The Corsair ran for a good ten minutes on a relatively fast tick over and was then switched off, rather than stalling to a stop like previously.